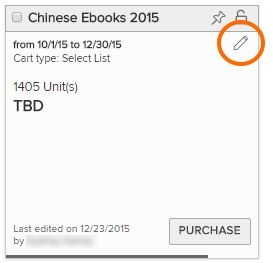 To edit a cart's settings, go to the Carts page and click the pencil icon on the cart you want to edit. This will allow you to change the cart's name, description, pin status, and lock status. To edit a cart's contents, open the cart. From here, you can delete titles or change the number of units for each title. To change the way a cart's contents are displayed, please see this help article. To delete a cart, select the cart(s) you'd like to delete on the Carts page. 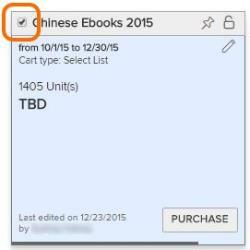 Then, click the Delete cart(s) button and follow the prompts to delete your cart(s). Please note that once a cart is deleted, it cannot be recovered.